Howlin' Wolf Records: SIX STRINGS: Monstrous Movie Music: Drive In Special!! It's a late night... you have nothing to do, may I suggest some snacks and your favorite someone and think back to the perfect drive in moments... 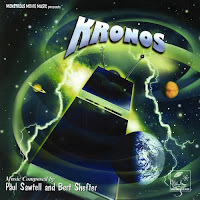 Okay some of you are clueless to what that might be, a "DRIVE-IN" is a place where you went to a film sat in your car, strapped on a big box to your car window... and watched films... sometimes you get a double feature like "Kronos and The Cosmic Man". Yes, I am trying to make a point, here you get the same. This is the first 2-CD set from Monstrous Movie Music, and we couldn’t think of a better two-disc release than one featuring the science fiction music of that classic composing team of Paul Sawtell and Bert Shefter (The Fly, Jack the Giant Killer, It! The Terror From Beyond Space). 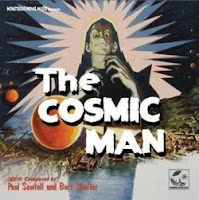 The Cosmic Man music is very powerful!